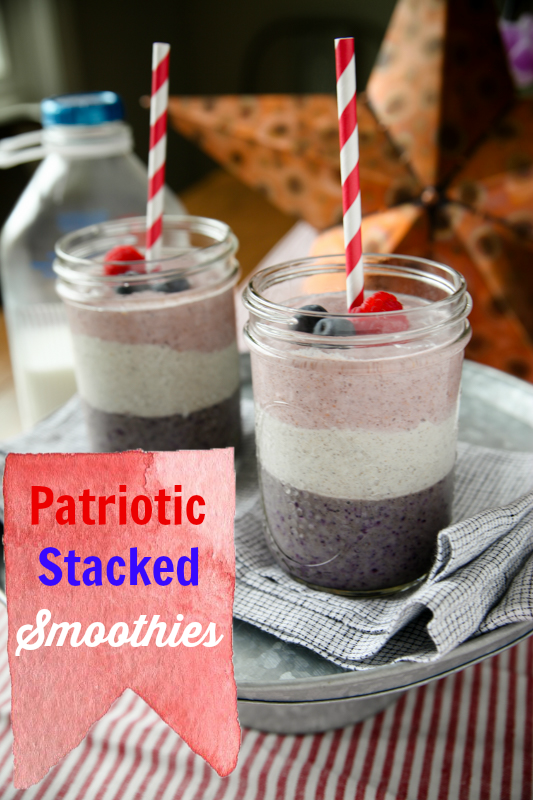 I am so excited to share this patriotic smoothie with you all today! 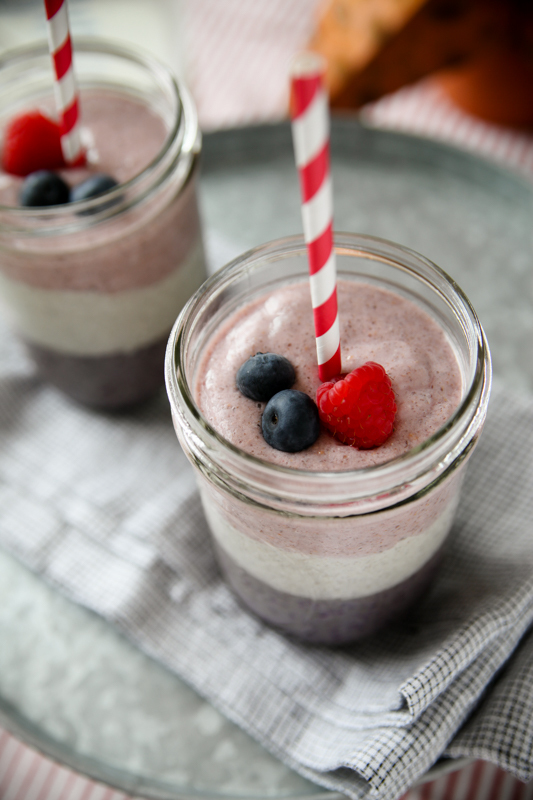 Stacked smoothies have been popping up on Pinterest, and when I brainstormed to come up with something red, white, blue to celebrate the 4th of July, my mind drifted to the rocket pops we used to eat poolside on steamy North Carolina afternoons. What could I make that had layers of red, white, and blue and was also nutritious, delicious and made with real food? 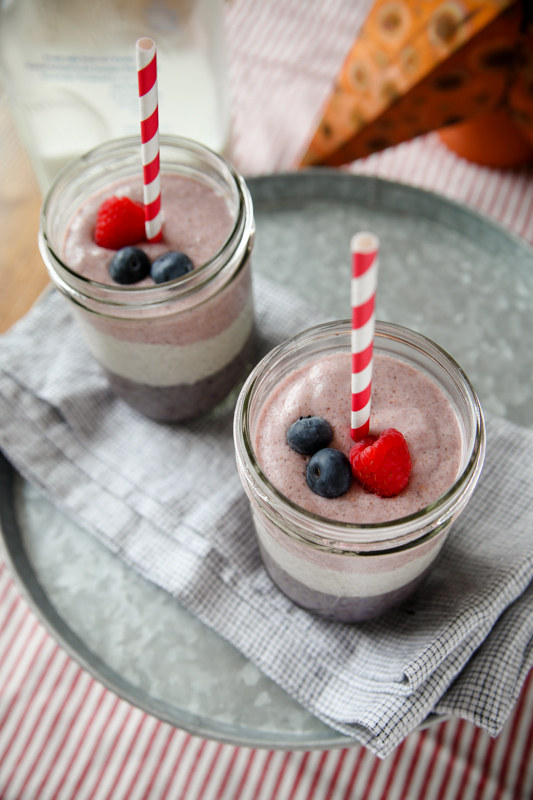 Making a stacked smoothie takes a little time, but the fun makes it worth the wait! Kids will love this. The key to the layers is adding thick ingredients like banana and chia seeds and placing each layer in the freezer before adding the next. This lets it firm up a bit and keeps the layers from seeping together, although if that were to happen it would still taste great! 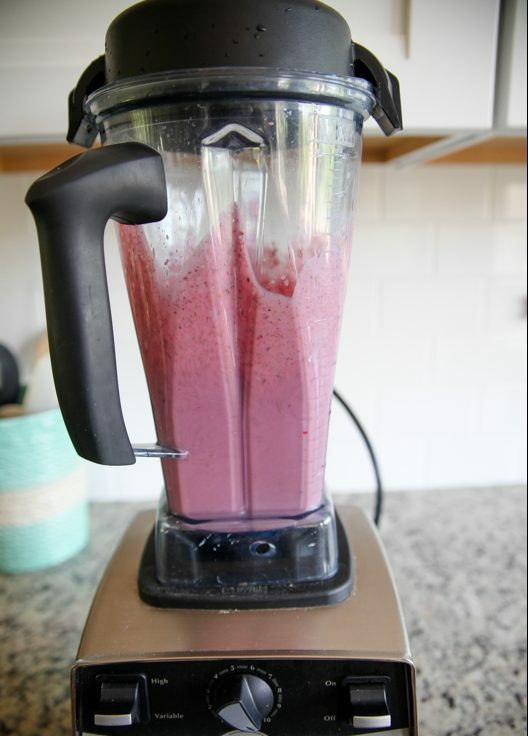 The red layer includes milk, red raspberries, chia seeds and banana. 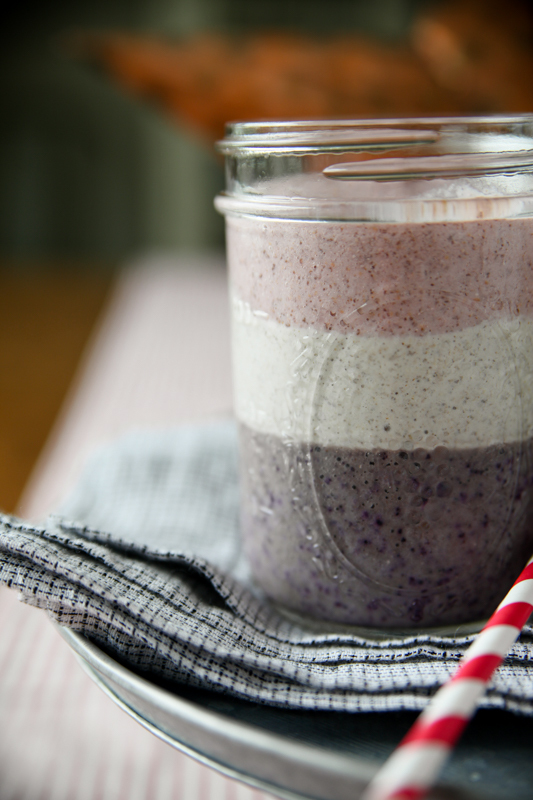 The white layer is made with milk, yogurt, banana, chia and vanilla. 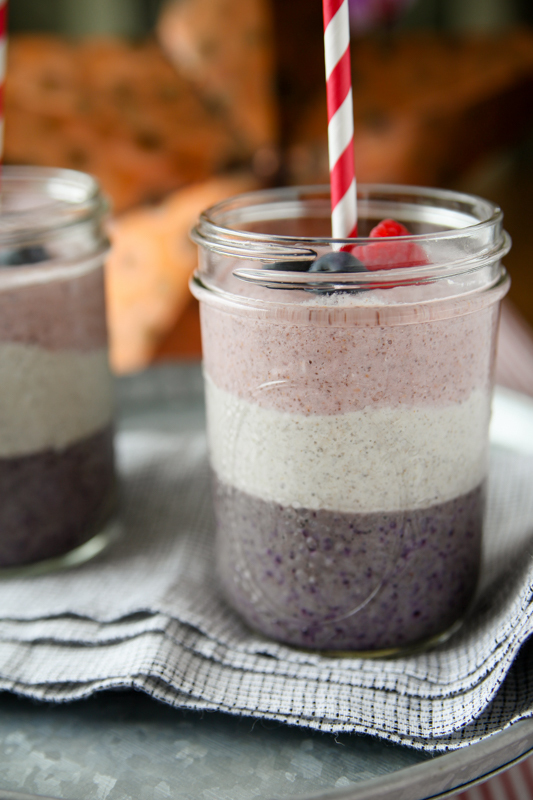 And the blue layer features milk, blueberries, chia seeds and banana. 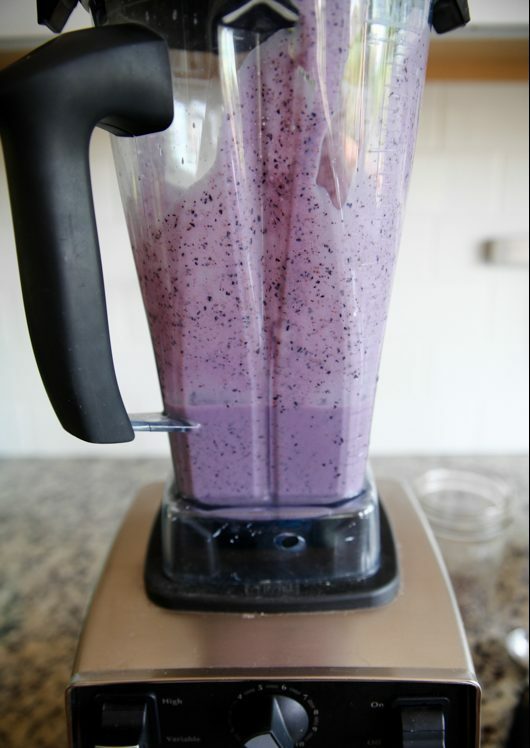 All three layers use milk as the liquid and protein backbone of the smoothie. This recipe makes four servings, but I divided between two bigger jars to really showcase the layered effect. I chose organic 2% milk, but you can tailor the recipe to your family’s preference by using any variety of real milk, as they are all wholesome and nutrient-rich. 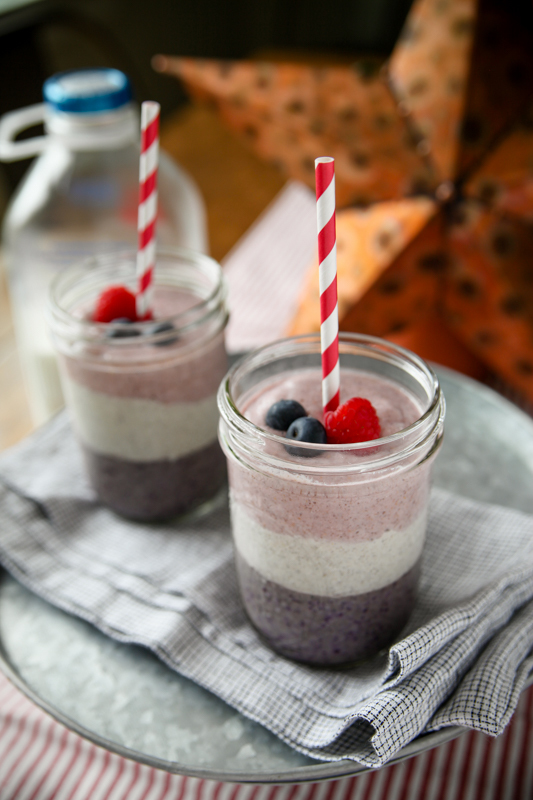 In fact, every 8 ounce glass of milk contains 8 grams of complete protein plus calcium and vitamin D. You can make these for a festive breakfast on a hot morning or serve them as an afternoon snack at a pool party! 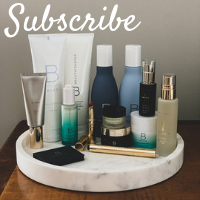 To begin, gather your ingredients and blend the blue layer ingredients together. 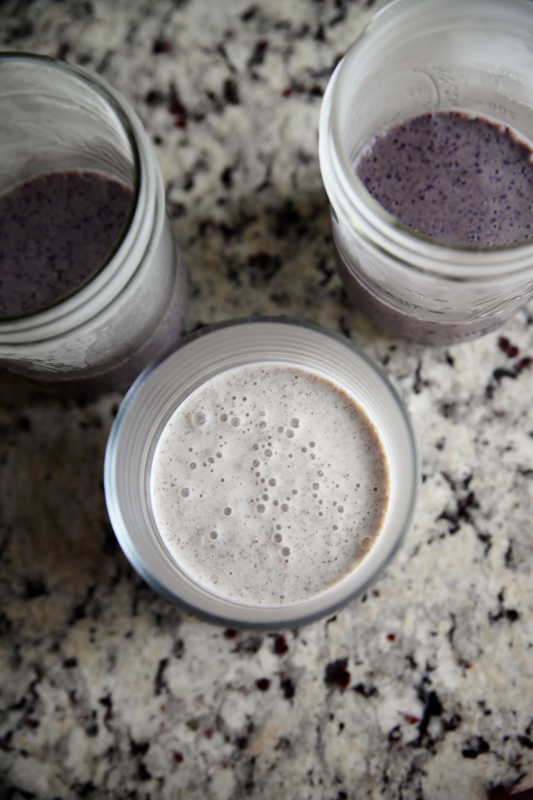 Pour the smoothie equally into four jars and place them in your freezer for 15 minutes. 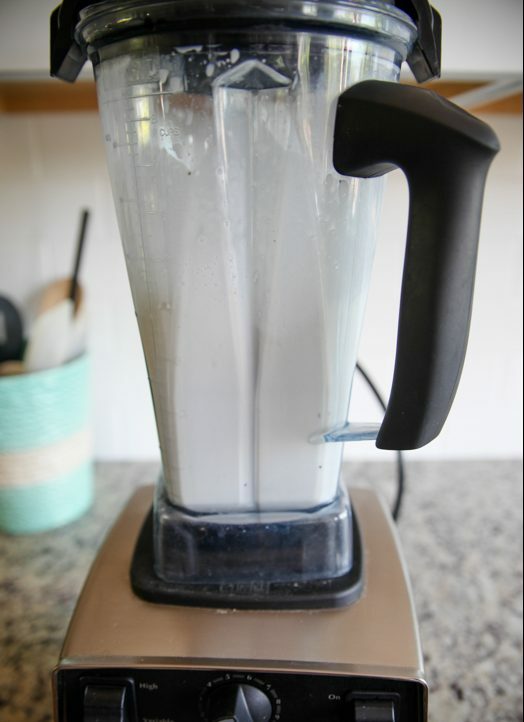 Meanwhile, wash out your blender and then blend the white layer. 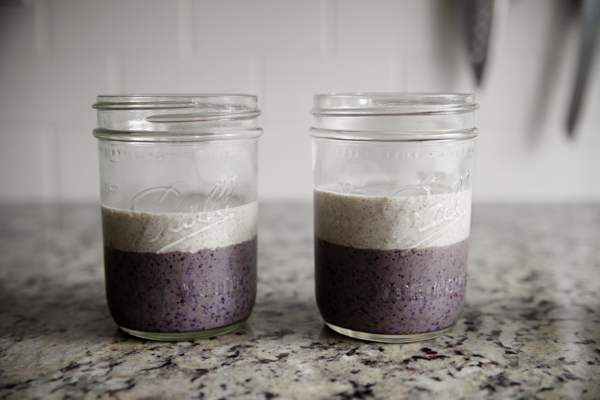 Place that layer in a cup and freeze to begin the firming process. After the blue layer is no longer liquid and feels like a pudding to the touch, about 15 minutes from when you placed it in the freezer, spoon the chilled white layer on top. Then return the jars to the freezer for another 15 minute rest. Blend your red layer and pour into a glass and chill that for about 10 minutes while you wait for the white layer to firm up. And finally, spoon the red layer on top of the white. Add a festive straw and a few berries for garnish. I actually loved eating this with a long spoon, but you should be able to use a wide straw too if you like. 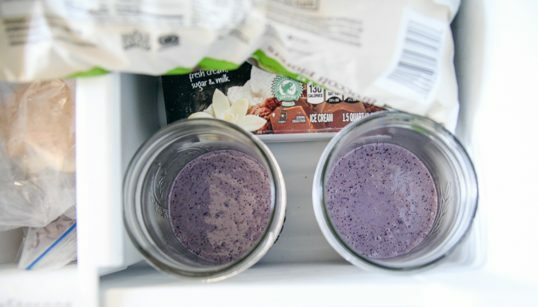 Blend blue layer, divide between four cups and place in freezer for 15 minutes. 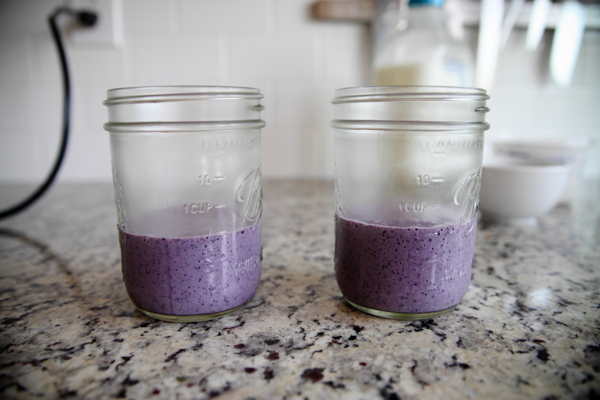 Blend white layer, place in cup and freeze for 10 minutes. When blue layer is no longer liquid, spoon white layer on top and freeze for 15 minutes. Blend red layer, place in cup and freeze for 10 minutes. When white layer is no longer liquid, spoon red layer on top of white layer. Serve with a colorful straw or a spoon. Thanks to The National Milk Life Campaign for the opportunity and for sponsoring this post! Find more milk info and recipe on Facebook, Twitter, Pinterest and Instagram. This looks so fun and festive! You list rolled oats in the ingredient list, but they do not appear in the directions. Which layer do I add them to? They are part of the white layer! Oats are listed in the ingredient list, but nowhere else. Where do they go? These are amazing, and I swear I can almost taste them. 🙂 Great descriptions and photos. I cannot wait to try these one weekend! 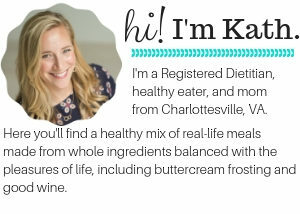 The sound like such a cool idea, but the idea of milk in July makes me a little nauseated….. any ideas for a good substitution? Milk shakes? Ice cream!? Summer! But you could always use a milk alternative if you wanted. Or possibly even a juice, although that would change the nutrition and protein content significantly. 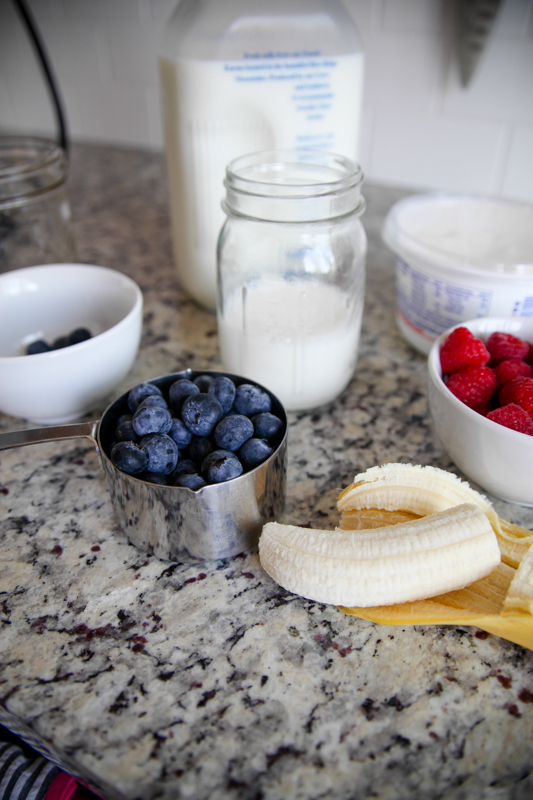 I love the layers on this smoothie! Everything looks so colorful and beautiful! 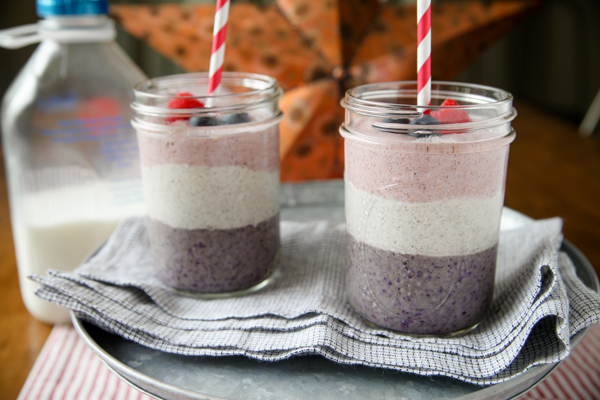 These smoothies look so festive & amazing! 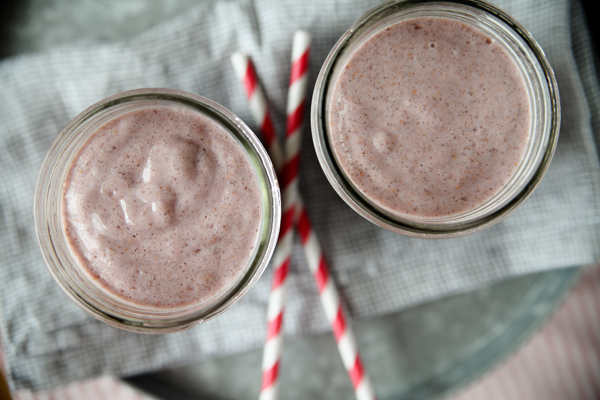 I love to make smoothies for our family, & our kiddos will definitely love these! 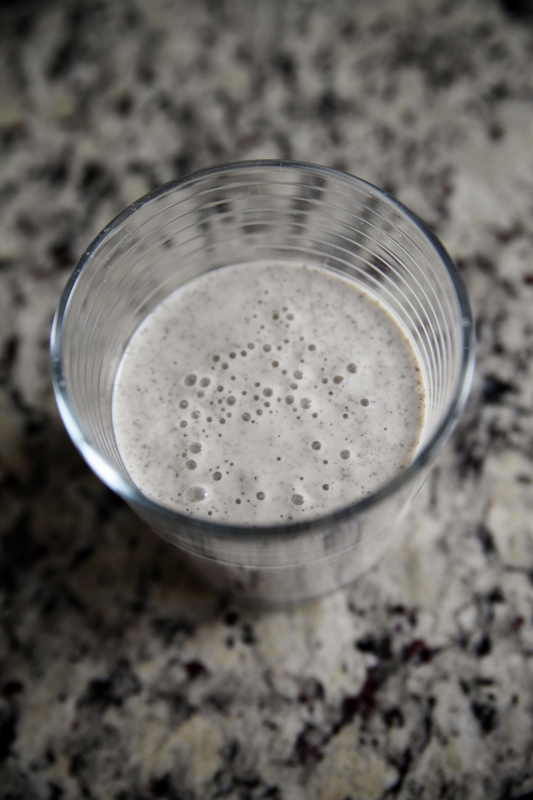 Can almond milk be used instead of regular milk? 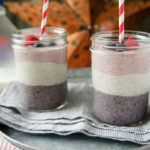 I can’t find chia seeds anywhere easily but really want to try this out – would it be possible to instead include rolled oats in all the layers to attain the same thick consistency?